As many of you know, I generally avoid writing about non open access publications here. But occasionally I make exceptions. And I am making one today. There is a wicked cool paper out in Nature today. Entitled “Hydrogen is an energy source for hydrothermal vent symbioses” comes from Nicole Dubilier, Jillian Petersen and others. It is about my favorite ecosystem(s) on the planet – hydrothermal vents. I became interested in these vents in 1989 when I met Colleen Cavanaugh who at the time was a Junior Fellow at Harvard. She told me about her work on bacteria that live inside tubeworms, clams and other creatures in the deep sea that are key to the lives of these animals. The bacteria are chemosynthetic (i.e., they use the energy of chemicals to drive carbon fixation). The animals have either no digestive systems or very degenerate ones and the bacteria function much like chloroplasts do for plants. The bacteria basically make everything for their hosts while the hosts collect energy (chemicals in this case) and oxygen and CO2 for the microbes. After hearing Colleen tell me about her work on these symbioses and how at the time nobody knew much about the symbionts, I joined her new lab at Harvard (she was just appointed as a junior professor) and worked in her lab in my Senior year and after graduating (and ended up publishing my first paper on symbionts of a clam Solemya velum). I have been captivated by symbioses ever since. So much so that many years later I worked with Colleen, Irene Netwon, Tanya Woyke, Dongying Wu and others to sequence and analyze the first genome of any of the chemosynthetic symbiotic bacteria. The discovery of deep-sea hydrothermal vents in 1977 revolutionized our understanding of the energy sources that fuel primary productivity on Earth. Hydrothermal vent ecosystems are dominated by animals that live in symbiosis with chemosynthetic bacteria. So far, only two energy sources have been shown to power chemosynthetic symbioses: reduced sulphur compounds and methane. 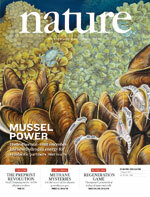 Using metagenome sequencing, single-gene fluorescence in situ hybridization, immunohistochemistry, shipboard incubations and in situ mass spectrometry, we show here that the symbionts of the hydrothermal vent mussel Bathymodiolus from the Mid-Atlantic Ridge use hydrogen to power primary production. In addition, we show that the symbionts of Bathymodiolus mussels from Pacific vents have hupL, the key gene for hydrogen oxidation. Furthermore, the symbionts of other vent animals such as the tubeworm Riftia pachyptila and the shrimp Rimicaris exoculata also have hupL. We propose that the ability to use hydrogen as an energy source is widespread in hydrothermal vent symbioses, particularly at sites where hydrogen is abundant. I am personally hoping that the authors post PDFs of the paper somewhere for everyone to read. I will post a link if they do. Petersen and colleagues’ work exemplifies the technology-driven revolution that is occur- ring in the biological sciences. The continuous development of ever more powerful and spe- cific molecular tools allows taxonomic identity and gene content to be linked to metabolic potential and activity, and to be visualized in context. As these techniques converge with new instrumentation that allows the in situ characterization of physicochemical parameters — even in environments as remote and extreme as hydrothermal vents — biologists are freed from their reliance on model organisms in artificial surroundings. Now, more than ever, our understanding of biology can be placed in the correct environmental and ecological context, enabling the discovery of previously unknown activities that support life.